The Dublin pirates were not all about pop and some stations served niche audiences or specific demographics. 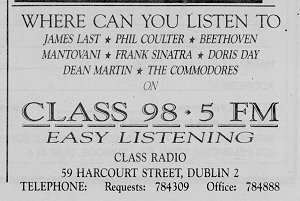 One station playing easy listening and classical music was KLAS which broadcast on 98.5 FM from November 1986 until the end of 1988. The station was established by Radio Carousel boss Hugh Hardy from his home in the suburb of Sutton but after a change in management it changed its name slightly to Class Radio and moved to the city centre. This recording is from early 1987 (we don’t have an exact date) and features David Baker on air. There are also agency ads and jingles. Thanks to David for the recording. You can hear an interview with David Baker about his involvement in KLAS here. Co-founder of this site John Walsh was also involved in KLAS and has recorded his memories here. 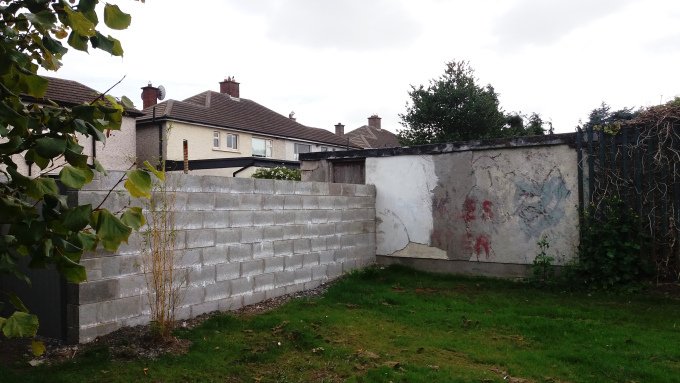 The Dublin pirates were not all about pop and some stations served niche audiences or specific demographics. One station playing easy listening and classical music was KLAS which broadcast on 98.5 FM from late 1986 until the end of 1988. The station was established by Radio Carousel boss Hugh Hardy from his home in the suburb of Sutton but after a change in management it changed its name slightly to Class Radio and moved to the city centre. We are delighted to bring you some recordings from 2018 from Wireless Flirt (the radio show about radio in Ireland). 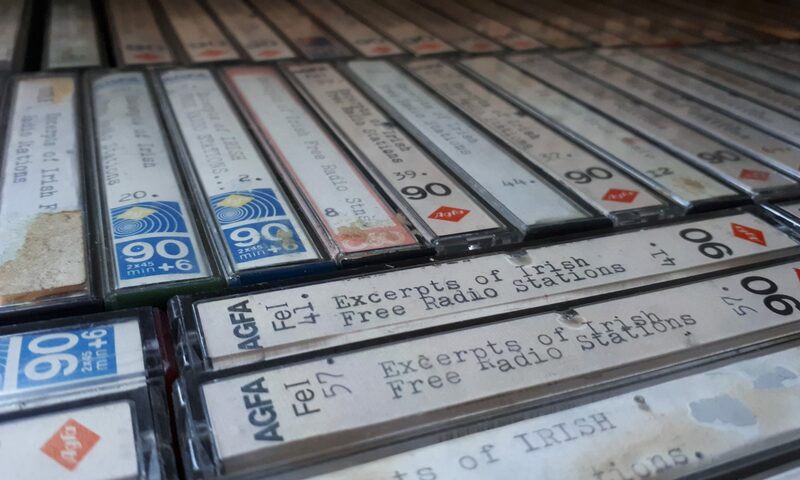 In this interview, John Walsh caught up with David Baker who worked for or managed a long list of pirates in Dublin in the 1980s. John worked with David in KLAS from 1986-1988.
image via Wireless Flirt : The garage at the back of 312 Sutton Park. The location KLAS first broadcast from.